The GranuFlo injury lawsuit attorneys at the Drug Law Center are currently accepting cases involving injuries and wrongful death caused by side effects of the popular dialysate medical product. A Class I GranuFlo recall was issued by the FDA after the medical products were found to increase the risk of cardiac arrest when the popular dialysis dialysate was not used appropriately. The dialysate medical product is used as an effective way to clean patient’s blood during a hemodialysis procedure. The dialysis fluid contains a mix solution of sodium, bicarbonate, salt, electrolytes so the product performs similarly to a kidney by pulling toxins out of the blood through the process of diffusion. The June 2012 Class I Device Recall involved in powder form of GranuFlo manufactured by Fresenius. The process of dialysis in a medical setting was invented in the 1940s. Since that time, there have been significant advances in the care and treatment of chronic and acute kidney conditions. Germany-based Fresenius Medical Care (FMC) brought GranuFlo and Naturalyte to the U.S. medical marketplace in 2003. The popularity of the dialysis drugs rose quickly through aggressive advertising as an effective treatment solution in filtering blood. However, significant problems were observed when an unexpected rise in the bicarbonate serum levels in both GranuFlo and Naturalyte that lead to potentially dangerous and catastrophic results involving stroke and cardiac arrest. By 2010, there were more than 900 reported cases of cardiac arrest from patients that had used the products. The following year, Fresenius Medical Care issued a warning citing serious dangers connected to the use of GranuFlo, after some patients had died. At that time, FMC products had been used in more than 34 million dialysis treatments that generated nearly $13 billion in net revenue for the company. Some patient advocates estimated that approximately 125,000 individuals receive dialysis treatment that included the use of GranuFlo and clinics not associated with Fresenius. At that time, the company failed to warn non-Fresenius clinics that the product had serious side effects. Failing to alert the public was thought to endanger those using the product during dialysis care. Every patient undergoing dialysis expects that the products being used during the procedure are not only effective but safe. Unfortunately, the drug maker who manufactures GranuFlo and Naturalyte have failed in the past to provide adequate warning of the potentially damaging adverse reactions and side effects to using their medical drugs. Fresenius Medical Care continues to manage more hemodialysis clinics in the nation compared all the competition. 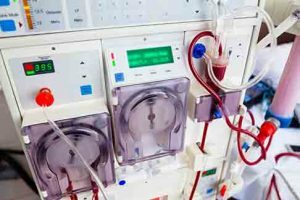 In addition, they supply most dialysis machines, supplies, and disposable products in the industry to their centers and other centers as well. The GranuFlo injury attorneys at Drug Law Center have investigated claims of injury of our clients who of undergone dialysis procedures that use Fresenius’s dialysis products. If you have been injured or lost a loved one due to cardiac arrest or another severe injury during or after a dialysis procedure, the products used during the blood filtering process could be the cause. Allow our attorneys to conduct a comprehensive evaluation of your dialysis injury case today. We are eager to hear your story through a complimentary case evaluation and investigate your claim to ensure your family receives an adequate amount of financial compensation to cover your damages. We are currently accepting all GranuFlo lawsuits through contingency fee agreements. This means if we do not win your case, we do not get paid for our legal services no upfront fees at all are required. The Food and Drug Administration performed a comprehensive investigation to determine if Fresenius violated agency regulations with their failure to inform the public, doctors, and patients that the product was linked to potential lethal risks. In 2012, a Fresenius internal memo was sent to physicians at the company’s dialysis centers warning them that improper use of GranuFlo and Naturalyte could be contributing factors in the rising number of dialysis patients who died unexpectedly from cardiac arrest. However, during that same time, the company failed to alert non-Fresenius dialysis centers of the problems associated with the use of their products. It was only after the FDA had received a copy of the Fresenius internal memo that the dialysis drug maker released an Urgent Product Notification warning other clinics of the potential risk of using their blood filtering products. The Food and Drug Administration announced that there were problems GranuFlo and Naturalyte when high bicarbonate levels produce a metabolic condition unexpectedly. The product is designed to remove toxins from the bloodstream during a hemodialysis process because water and extra salt in the patient’s blood no longer have the capacity to filter toxins in the kidneys. To be effective, the blood must contain a specific percentage of neutralizing acid. During dialysis, bicarbonate (an alkaline substance) is supplied to the patient to complete the filtering process. Unfortunately, patients have been placed at significant risk when unexpected excessive levels of bicarbonate cause significant heart problems during and after the procedure. Without effective and immediate treatment, severe adverse events and unexpected side effects including cardiac arrest, health problems or wrongful death might occur. Even so, GranuFlo and Naturalyte products involved in the recall have not been removed from the medical marketplace. As part of the recall, the drug making manufacturer Fresenius announced it would update warning labels on both products. Many plaintiffs have filed GranuFlo lawsuit against FMC, the product manufacturer, citing a number of allegations. Most of these include GranuFlo and Naturalyte-associated severe injuries, some of them involving an increased potential of death. The allegations also state that the company failed to provide adequate warnings and concealed serious and potentially fatal heart attack and stroke injuries while advertising the product is being safe and effective for dialysis. Many of these plaintiffs are claiming that the drug maker was aware, or should have been aware, that the products they sold in the medical marketplace were not safe. Additional allegations state that the company knew that the products cause severe medical problems and yet took no action to inform the public until forced to by the Food and Drug Administration until after an internal memo was leaked. Lawsuit documents reveal that the company had a legal duty to provide adequate instructions, training, and information to doctors, nurses and other medical health care providers performing dialysis treatment to ensure that the dialysis products were used properly, effectively and safely. Many lawsuits were filed because the patient developed arrhythmia where their heart stopped beating. Others suffered fatal cardiac arrest when blood flow was blocked to the heart. A wrongful death lawsuit has been filed by the wife of a Georgia man who lost his life in April 2013 from a heart attack caused by defective products used during his dialysis treatment. The plaintiff claims that Granuflo – a hemodialysis additive – was the initial cause of her husband’s heart attack at the East Ridge Tennessee treatment center. Three times a week since 1997, the husband had been receiving dialysis treatment. But in June 2013 he suffered a heart attack, which happened again in April 2013 on the day he died. The man’s wife claims that the dialysis product manufacturer was aware, or should have been aware, that there were associated risks with using GranuFlo and Naturalyte and yet the company failed to warn her husband. She is seeking financial compensation for their breach of an express warranty, strict liability, failure to warn, negligent misrepresentation, negligence, breach of implied warranty and violating the state’s consumer protection act. In addition, she alleges the company concealed and misrepresented the product and is suing for both compensatory and punitive damages. Long before there was a GranuFlo and Naturalyte recall by the FDA, a lawsuit was filed with of surviving family members of an Illinois patient receiving hemodialysis treatment at a Fresenius Medical Care treatment center in 2009. As a patient at FMC, the woman was to receive dialysis treatments three days every week. However, problems arose during her third hemodialysis treatment, where a series of mistakes by the facility allegedly caused her death. The surviving family members (the lawsuit plaintiffs) alleged that the facility caused “many, many mistakes” that led to their loved one’s death. Even though the plaintiffs and defendant (FMC) reached a seven-figure settlement agreement to cover the family’s expenses and damages, Fresenius Medical Care has yet to admit any wrongdoing. Suffering Dialysis Injuries Caused by GranuFlo? The GranuFlo injury attorneys at the Drug Law Center represent many clients who have suffered a life-threatening heart attack or lost a loved one after receiving dialysis treatment with GranuFlo and/or Naturalyte. If you suspect that these medical filtering products contributed to or caused your heart problems such as cardiac arrest, sudden heart attack, cardiopulmonary arrest, arrhythmia, stroke, hemodialysis cardiac arrest or another heart issue, contact us today to discuss your case. We provide confidential, free consultations to discuss every aspect of your recompense claim. Our law firm is currently accepting GranuFlo and Naturalyte lawsuit clients for individual and multi-district cases. We offer a “no win/no fee” guarantee. This means we postpone the payment of all of our legal services until we have negotiated an acceptable settlement outside of court, or win a monetary award at the conclusion of a successful jury trial. Our legal team of personal injury and wrongful death attorneys have years of successfully resolving cases to assist our clients who have suffered serious injuries by faulty medical devices and effective pharmaceuticals. We are ready to begin working on your case today.